When people work together effectively in a structured way, they can produce better ideas faster and with fewer resources. For collaboration to reap big benefits, both an organizational framework and individual competencies must be in place for six key areas: collaborative groups, communication, coordination, culture, focus and process. When there are cracks in the organizational foundation or gaps in manager skill sets that signals an opportunity for Organizational Monsters to invade your organization, strategies, programs and projects and reap havoc on your collaborative efforts. Once they are in, they cost you time, money, results, credibility, and momentum. 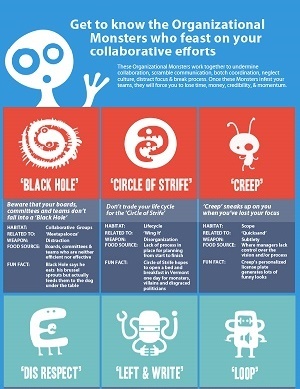 This Infographic introduces the twelve Organizational Monsters who make themselves at home at the organizations expense. Take a minute to familiarize yourself with ‘Black Hole’ and ‘Meetapalooza’ (Groups), ‘Loop’ and ‘X-Lack’ (Communication), ‘Creep’ and ‘Quicksand’ (Culture), ‘Dis Respect’ and ‘Whatever’ (Focus), ‘Left & Write’ and Wasteful (Management), and ‘Circle of Strife’ and ‘Wing It’ (Process).